This blog originally appeared on Times Red Box. A few years back there was an outbreak of national angst about no one studying history any more. The House of Lords even managed a debate on it. That worry seems a long way down the list of concerns these days, when everyone has the latest Donald Trump tweet or summit with an autocrat to worry about. But a history lesson or two for policy makers wouldn’t go amiss over the summer break, because amid the growing Brexit-related chaos something else is on the rise, but receiving far too little attention: child poverty. Last year was not a good year for anyone’s living standards. High inflation ate into pay, leaving typical households with estimated income growth of just 0.9 per cent. This was down on the 1.6 per cent growth they enjoyed the year before, and well short of the 2.5 per cent they came to expect before the crisis. 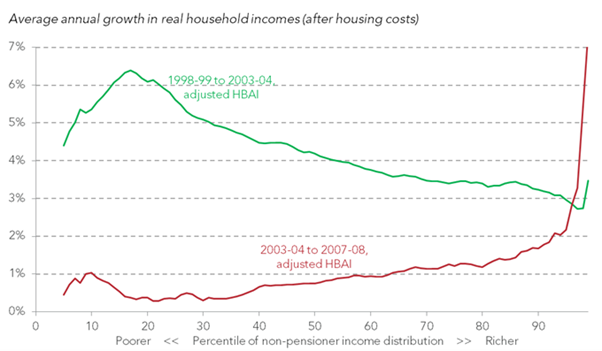 But that paltry growth for middle income households was actually as good as it got. 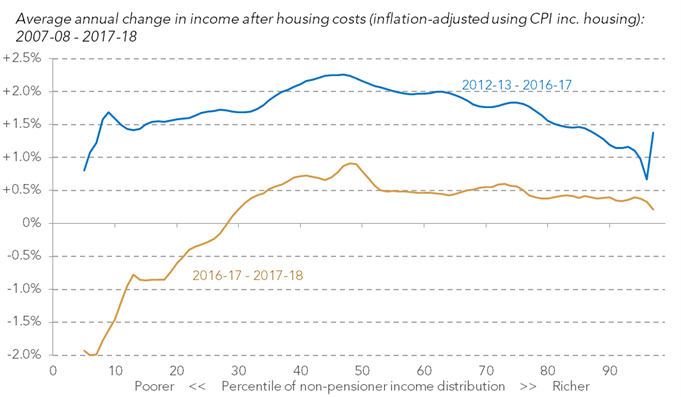 As the chart below shows, higher income households had even weaker progress, and for the poorest third of households, incomes are estimated to have fallen over the past year. This trend of the middle doing better than the top and the bottom continues the pattern of the last few years with the result that inequality has been broadly flat since 2010-11. But with the value of tax credits and child benefit falling by 3 per cent, the bottom of the household income distribution has fallen away from the middle – or to put that into more meaningful, but more depressing language, child poverty is likely to have increased last year. 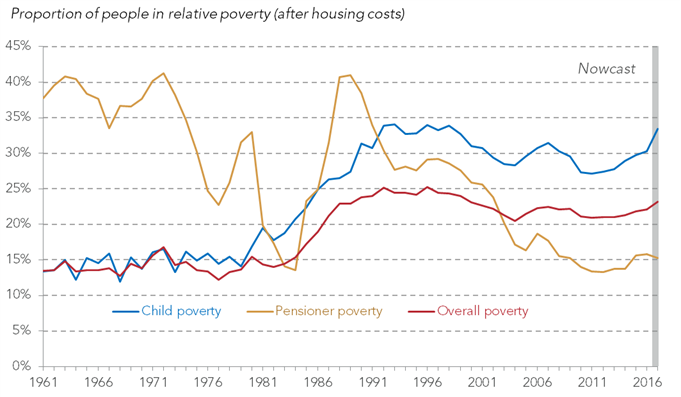 This rise continues a post-crisis trend and is happening despite politicians of all parties aiming to reduce child poverty. Too often this rise is seen as inevitable, as the consequence of rampant capitalism that will outdo any government attempt to bring child poverty down. And that is where the history lesson comes in, because history shows us Britain has been capable of making huge progress on child poverty when it wanted to. 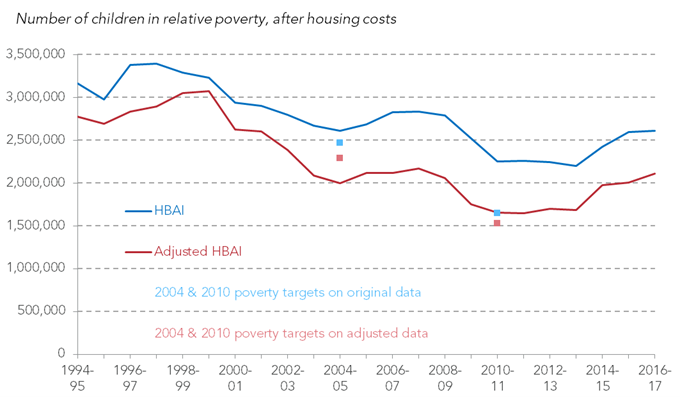 You often hear the view around Westminster that little progress was made reducing child poverty even when big increases in spending on benefits for low income families with children were taking place in the 2000s. The famous goal, set in the late 1990s, to halve child poverty by 2010 was missed by miles they say – and that is indeed what the official data says. But that data is wrong. Innovative new research by the Resolution Foundation shows that it fails to take account of the £1 in every £5 of benefit expenditure that is missing in the official government surveys of household incomes used to calculate child poverty rates. 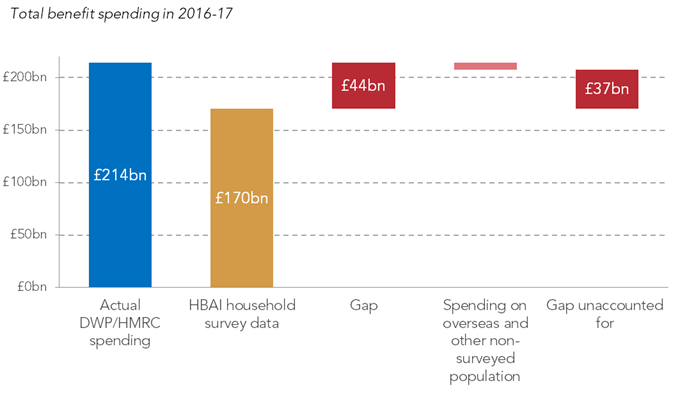 Even after we allow for the fact that some benefit expenditure goes abroad or to groups, like those living in care homes, that do not appear in official surveys the gap between actual and report benefit income remains huge at £37 billion. Once we take that fact into account, we get some good news. Household incomes are higher and poverty is lower than official figures suggest. Specifically, the number of children living in poverty fell from 3 million in 1998 to 1.6 million by 2010. Child poverty might not quite have been halved, but as a country we got much closer to it than has been previously thought, as the chart below shows. Of course, not everything was rosy on the poverty and inequality side of things in the 2000s. Inequality remained far too high as a legacy of the 1980s, and from 2003-04 housing cost increases bore down on the living standards of lower income families in particular and the top 1 per cent soared away from everyone else. As with any good history lesson the legacy of the 2000s is complicated. But one lesson is very clear: if you want to reduce child poverty, cash transfers are not a nice to have, are not corporate welfare, and are not something you can slash while claiming we’re all in it together. Instead they are an essential part of a strategy to ensure children do not grow up in poverty through no fault of their own. That doesn’t mean they are cheap, or without trade-offs, but it does mean they are the right thing to do. So as Britain faces the risk of sustained rises in child poverty, we should look back to the past if we want to make the right decisions for the future – it’s time for a history lesson.